Purchased or rented various movies and TV shows from iTunes, but found those M4V files are DRM protected and cannot be freely transferred or played? Don't worry about it! Here you will find all the tips about removing DRM from iTunes M4V videos for all kinds of usages. 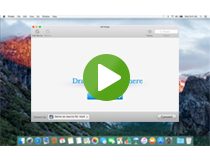 Having problems on how to remove DRM from iTunes M4V videos? Here you will get all of the guides and tutorials about how to use iTunes DRM Video Converter to remove DRM and convert iTunes M4V to unprotected videos for legal usages. It is so good to play online videos on TV. Would like to watch iTunes movies on big TV, but find iTunes movies are not supported? Don't be upset. Here we provide you solutions to stream iTunes movies or TV shows to TV for your enjoyment. Bought and rented many movies from iTunes and want to transfer them to Android and WP devices for playing? Here we provide useful tips and guide for you to remove DRM and convert iTunes M4V videos for playing on HD Media Players, Android phones/tablets, Windows Tablets and WP phones. Movies and TV shows downloaded from iTunes can be only played with iTunes, as for other video players, you need to remove DRM first. Here are some tips for you to remove DRM and convert iTunes videos for video players, video editing programs and DVD burners. If you are an Apple Music subscriber but find difficulty in downloading songs from Apple Music, these are some articles that may help you get it over. Here you'll learn how to get rid of the DRM protection from Apple Music, the best way to convert your Apple Music to DRM-free MP3, AAC, WAV and FLAC format as well as useful tips about using Apple Music. Want to download music from Spotify for playback them freely? How to keep Spotify Music playable after canceling Spotify Premium? Is it worth upgrading the Premium subscription? Don't worry, here you will find all the Spotify Converter Tips you need.